The International Energy Agency (IEA) released its annual World Energy Outlook today, with the report showing the United States poised to lead in the effort to fill the growing global energy demands. Forecasting global energy production and consumption through 2040, the IEA projects the U.S. will account for nearly 75 percent of global oil growth, and 40 percent of natural gas growth through 2025. 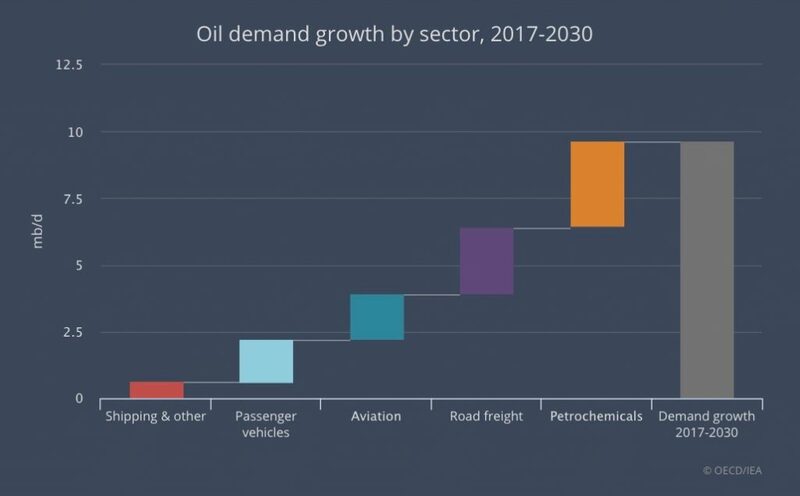 In the IEA’s New Policies scenario — which the agency considers the most likely set of circumstances as it follows existing climate policies and assumes adherence to declared policy intentions are followed through on – oil demand grows by around 1 million barrels per day (mb/d) on average each year to 2025. “On the supply side, the United States provides nearly 75% of the increase in global oil production to 2025. This scenario is a win-win for the United States: the growth in petrochemical sector is helping to drive up demand for domestic energy production, while our abundant supply of oil and natural gas liquids is also simultaneously drawing massive investments from the industry at the same time. In the 2017 World Energy Outlook, the IEA projected global natural gas use would increase 45 percent by 2040. This year, the projection was revised upward by almost 100 billion cubic metres. Under the New Policies Scenario, natural gas is the fastest growing fossil fuel, becoming the second-largest source of energy after oil in 2030. The report forecasts demand growing by 1.6 percent per year, with natural gas consumption almost 45 percent higher in 2040 than today. Given the prolific natural gas production coming from the Appalachian, Permian and Haynesville shale plays, it is perhaps not surprising the IEA is projecting the United States will account for such a massive share – 40 percent of total gas production growth, according to the report – to 2025. “Surging growth in global gas trade – underpinned by the shale revolution in the United States and the rise of liquefied natural gas (LNG) – continues to accelerate the transformation of gas markets. Last year, the U.S. quadrupled its LNG exports from the previous year, exporting 1.94 billion cubic feet per day. A number of new LNG projects, in various stages of development, are set to come online in the coming years. These new terminals will have the capacity to double exports, furthering the ability to take advantage of our resources and the growing market. As it did the year before, and the year before that, this year’s World Energy Outlook goes a long way to showcase America’s standing as a global energy leader. Given its findings, the United States looks poised to lead, and meet the world’s demands for the foreseeable future.